I love the Holy Land. I’ve visited eight times over the last fourteen years, and grow increasingly homesick every time I leave. “in the morning, a great while before day, he rose and went out to a lonely place, and there he prayed. And Simon and those who were with him followed him, and they found him and said to him, ‘Every one is searching for you’” (Mark 1:35-37). “Lord teach us to pray” (Luke 11:1-4). 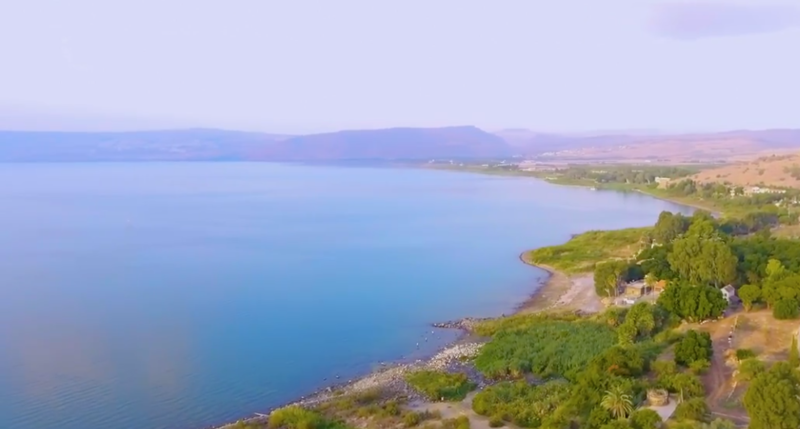 In the Sermon on the Mount (given on the mountain above the Eremos Grotto), Jesus instructed us to establish a dedicated place for prayer (Matthew 6:6). The Greek word is “tameion” and is most often translated as “room” or “closet.” It’s often used to indicate a room used to hold valuables or treasures. It was analogous to the decorated Torah closets that have been found in first-century synagogues, like Magdala. These closets used to house the Torah and other biblical scrolls and acted as mini Holy of Holies far from the Jerusalem Temple. Modern synagogues also have Torah closets, not unlike the tabernacle in a Catholic Church, where the scrolls are kept and honored as signs of God’s presence and voice. Both the Eremos Grotto and Christ’s instructions in the Sermon on the Mount invite us to set aside a special place in our home where we can pour out our hearts to the Father. We may choose to adorn our prayer corner or closet with “valuables” like crosses, icons, devotional items or books. But what makes this space priceless is that it’s consecrated for communion with God in prayer. Here’s some good news. You can carry your Eremos Grotto with you wherever you go, reserved in the inner chamber of your heart, where the Lord is welcome to come and commune with you. You can be sitting on an airplane, standing in line at the bank, or waiting at a red light and still slip away to your Eremos Grotto within. “Jesus often draws apart to pray in solitude … [and] His words and works are the visible manifestation of his prayer in secret” (CCC 2602). Jesus demonstrates to us that we can’t hope to speak with power, transform lives, bring healing to another, or find victory over sin in our own lives if we don’t build a rich, strong foundation of secret prayer. So let’s carve out a cave of prayer in our homes and our hearts to be with the Lord, where we can pour out our spirit to him, and like Elijah in his cave, listen for that “still small voice” (1 Kings 19:11-13).